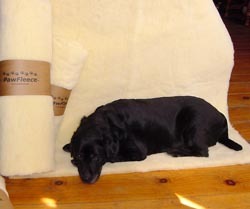 PawFleece™ looks and feels like a real sheep skin rug. The quality, durability and easy care of PawFleece™ will delight both you and your pet!! What better satisfaction than savoring the sight of your beloved pet cozily curled and comfy on a bit of luxurious bedding?? Your pet will enjoy and USE it night after night, year after year! 30" x 40"